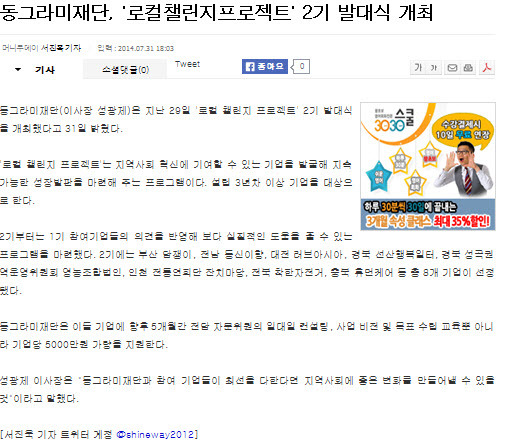 The Circle Foundation (동그라미재단, chairman: Seong, Gwang-je) announced on the 31th that they had the 2nd starting ceremony of Local Challenge Project on 29th. 'Local Challenge Project' is a program that finds (and supports) enterprises that would contribute to the innovation of local community and offers them the sustainable toehold for growth. It requires the enterprisers to be over 3 years since foundation. The program this time reflected the opinions from the enterprisers of this program's first session, to provide practical help. Total of 8 enterprisers were selected for the program this time (2nd session); Busan Damjaengi, Jeonnam Deungsinihang, Daejeon LoveAsia, Gyeongbuk Seonsan Haengbok Ilteo, The Comitte of the Seonggok Gyeongbuk Farming Association Corporation, Incheon Janchimadang, Jeonbuk Chakan bike, Chungbuk HumanCare. The Circle Foundation will provide approximately 50 million won to each enterprise as well as one-on-one consultation by advisory committee, and education on setting up business goals and plans, for the next 5 months.